I ran across one of my dads old PC's and took these out of it while i was taking it apart( i want the case ), thought these pics would bring back old memories for some of us. Yeah, i am sure i wont keep this stuff, unless someone wants it for some odd reason. I just thought i would share it on here for a trip down memory lane. I also have a Midiman sound card, and an old D-link ethernet card, and an old tape drive, a couple 2x cd drives, a 250w PSU, and the Dell motherboard that was home to all this stuff. I just wanted the case it was all in. I plan on modding the case.....it has an interesting vertical hard drive mounting system that is removable, and a couple other interesting features. I will try to post some pics of it soon, as i plan on starting the mod project very soon and using it for my next build, but i probably wont start gathering components for the build until early next year, probably when my tax return comes in, so my choices for Conroe MB's, etc. will be more varied and hopefully cheaper than they are now. Last edited by NarkotikBuzz; 28th September, 2006 at 09:40 AM. I got an old computer from a friend and tore it apart. Inside I found an old Voodoo Graphics card. I don't know what version and I've never had one before, but I have heard several people mention them. 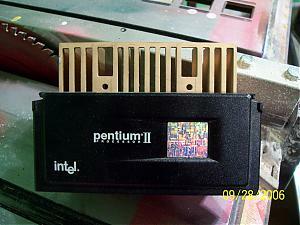 This computer had the same kind of processor mount and it was a Pentium III. Isn't the processor permanently soldered to the board? I'm not sure what they are good for today... maybe a firewall computer? I think I have those laying round as well. Strange the stuff we hold on to isnt it. I am glad that processors dont have those slot mounts anymore, they took up so much space once you added a heatsink and maybe a fan. The one i have is passively cooled though. It was a good computer in its day, i remember playing DOOM for the first time on a rig like that......mmmm, memories. "Voodoo" was a cool name that stuck in folks's brains. 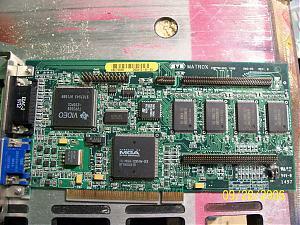 I still have a PCI Voodoo Vidcard. Never know when a PCI vidcard will come in handy. The HS size was intentional. With a slot, you could accomodate massive heatsinks allowing for quiet PCs. I had a dimension from the same time frame. Is the case plastic on the outside with shielding on the inside? I love that case, made by palo alto. Since it is plastic, it is light, and does a good job dampening the noise. If you still have the PSU, throw it away. The dells back then crossed wires so if you try to boot up a standard mobo with it, it will literally blow out both the mobo and the PSU. Also, the mobo connecters to the front panel are proprietary as well. You can cut the connector to the front panel (looks like a floppy cable) and wire to the new mobo. I did it a couple of years back, and with a bit of patience, didn't take too long. EDIT: Almost forgot... The back panel is proprietary as well. The size of the backplate is actually slightly small. If you fit a mobo, make sure it will fit. Mobos with sound connects mounted perpendicular to the mobo will NOT fit the space. Last edited by SteveI; 29th September, 2006 at 04:13 PM. Tell you what, If you see any VooDoo 2 12MB cards around, keep hold of them. They are becomming collector's items. A mint condition matched pair of Guilmont (sp?) Voodoo 2 12MB cards for SLI sold on ebay in Australia for about the same money as a 6800GT. They are getting rarer and rarer. The two I have sitting here were in a Celeron 300A / 440BX / PC150 BGA Kingmax / Awe64 Gold nostalgia machine I built many years ago, and at this point, I'm contemplating having them cleaned, mounted on some black velvet, and put in a frame side by side, perhaps with the 300A in between them. What a piece of geek art that would make. Last edited by weldzilla; 29th September, 2006 at 06:54 PM. If the females in my life can collectively decide to COLLECT / HOARD any type of antique / retro / rare TupperWare, then I'll keep as much computer history as I can. 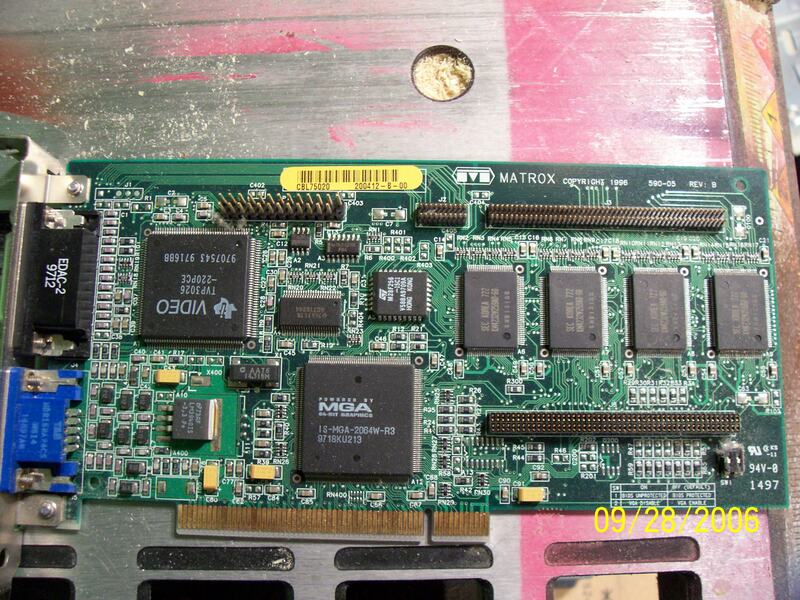 A Voodoo 2 is easily the most historically significant video card ever. Its the Corvette split-window coupe, the BMW 3.0CSL, the Mercedes 300SL, the Miura of the video card world. Not the first by any means, but the most significant. Similarly, all these old pieces of hardware are uniquely special in their own way. Far more significant than a 1972 TupperWare Dip'N'Serve with a burp seal. Has anyone counted how many form factors we've been through in the last 10 years? Yes, the case i have is plastic with metal shielding inside, but by the time i am done cutting on it, and modding it out, it will be a different case completely. I also have a more modern Dell case that i can mess around with as well....its from my Dimension 4400 from just a few years ago....not sure what i could do to it, but i might get creative with it one of these days. Last edited by NarkotikBuzz; 30th September, 2006 at 12:19 AM. Ahh, nostalgia. How many form factors? Eep, can't count them right now, pain pill impaired. K6, K62. Socket 7, Socket A, P, P2, P3, P4, LGA-775. Slockets, loved one of the Celly 300A's I had. Permanently severed the required pins to avoid any possibility of overvoltage and instant death. Magnifier and a jeweler's hand drill, those were the days. P II envy, root beer budget. Waiting in line at 4 AM in downtown Seattle for the chance of a free Athlon XP and a mobo to go with it. Daniel ~ was there, neither of us won. AMD gave out only a few m'boards and 'Athalons.' And so on. Not by any means extensive but it gets you there. Not so old for me - I was using one of these until about 4 months ago. Hehe. The heatsink off the TNT2 worked quite well as a chipset cooler on the new system too, after a bit of work with the drill. Socket 499 is hard to find, but technology from here ended up in Slot A and Socket A.
Incidently, Intel will stop making 386 processors in September next year (2007). I know that some 386 processors were socketted, but I have no idea what the socket was.